Since its creation in 1915, the Coca-Cola contour bottle has become one of the most recognizable objects in the world. Noted industrial designer Raymond Loewy referred to it as the “perfect liquid wrapper,” and a new exhibit at the World of Coca-Cola reveals why the iconic bottle is also the perfect canvas for one-of-a-kind artwork. 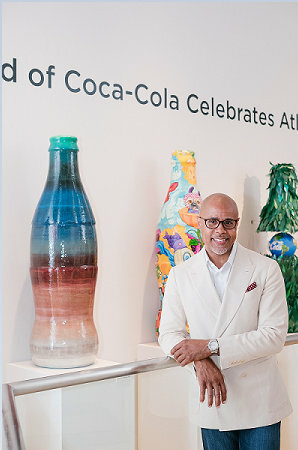 The “10 Artists, 10 Bottles” exhibit, which opened May 19, features the work of 10 Atlanta artists who were invited to transform 4-ft. sculpted Coke bottles into unique pieces expressing their diverse styles. The collection of larger-than-life bottle art incorporates a range of styles and media, from contemporary painting torecycled glass bottles and more. The exhibit is on display in the Pop Culture Gallery until May 2018.
emone is originally from Buffalo, New York but spent the real growing years in Dayton, Ohio. Now Atlanta has been his home for the past 28 years. Since his early childhood, drawing, crafting and building has always intrigued him. Demone's ability to draw was evident well before attending structured art classes in grade school and college. "I come from a very musical and creative family. My father, brother and I are musicians, as well as several cousins and uncles. I was exposed to music and art early on, but by my early 20's, art took center stage". His appreciation for art - in all forms - has exploded in recent years. Trips to New York, Paris and Rome are filled with visits in and out of museums and galleries. Demone has spent extended time in Paris and Moscow, which he says has been an unparalleled experience. Among the artists that catch his eye are Mark Lague, Liz Gribin, Sidney Carter, Harry Ally, and Maxwell Parrish. "Art, like jazz, allows you to be free. When the sky's the limit, you can express your heart's desire. That's what art does for me."